Looking good when it's hot out is hard enough as it is, but looking good at work when it's hot out? No one has the time (or money) for that, right? Wrong. There are actually a handful of simple and inexpensive swaps, or in some cases, additions, you can make to your workwear wardrobe that will leave you feeling cool and looking even cooler while at the office. It's no secret that there's a fine line when it comes to dressing appropriately for summer while at the office, even if you work in the most casual of environments. Between the ongoing debate of whether off-the-shoulder tops are okay for the office and whether can you wear jeans beyond casual Friday, we decided to play it safe in this roundup and show you pieces that you can wear without HR pointing any fingers. This includes colorful blouses (hello, summer! ), white blazers (we feel cooler already), and skirts that have slits (never miss another breeze again) all for under $100. Now sit back, relax, and shop pieces that won't make you break a sweat. Keep reading to see our under-$100 guide to looking great at work this summer! Make any outfit more interesting with a blouse that has more than two colors. Since you won't be wearing too many different pieces at once during the summer months, you want to make every piece as interesting as possible. The abstract print on this shirt makes it irresistibly cool. For those of you who can't bear wearing closed-toe shoes in the summer heat, opt for a sandal that has a block-heel and simple strapping. This style looks polished while keeping you cool. A round of applause for a pair of sandals you can walk in for miles. Shorter hemlines are pretty risky, no matter what office you work in. To allow for some breeze while abiding by conservative skirt lengths, choose skirts that have a slit in them. Trust us, this little detail makes all the difference. Sometimes your outfit just needs that third piece. But this summer, don't let it weigh you down. Swap your coats and thick vests for lightweight sleeveless jackets or blazers. Layer this over a button-down at work, or over a T-shirt and jeans on the weekends. Silky blouses don't always feel the best in the heat, but a white T-shirt might not cut it in the office. 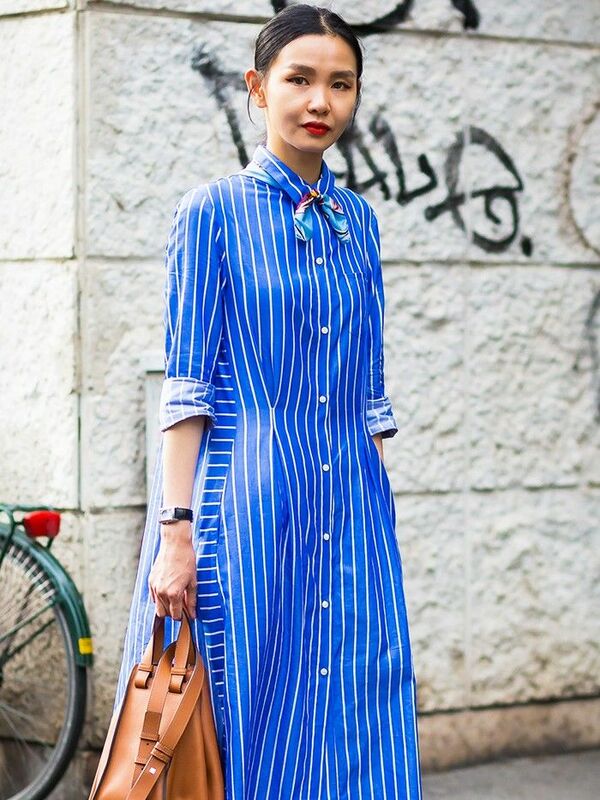 In cases like this, a striped T-shirt does just the trick, as it's a classic print and a safe silhouette. The best part about this shirt is that it's actually a knit. Sick of wearing pants? Then drop them completely and wear a shirtdress instead. The material is guaranteed to keep you cool while looking more than ready for any meeting. This bow detailing accentuates your waist in all the right places. Every fashion girl has one of these upgraded button-downs; they work for the office and beyond. This is the easiest way to take a classic workwear item and give it that elevated twist. The fashion girl way to wear a white button-down. When it comes time to ditch your stilettos for a more practical pair of shoes, make sure they still look just as polished as the rest of your outfit… You never know who you might run into. Slides over flip-flops are always a great choice. There's definitely room for current trends at the office, especially slip dresses. Proving to be one of the most layerable pieces in your closet, we recommend wearing yours over a T-shirt, underneath a blazer, or even paired with a white button-down. This breezy dress is your answer for how to wear all black in the summer. The amount of stuff you need to carry probably isn't changing too drastically with the seasons, but that doesn't mean your bag shouldn't. Swap your basic black tote for one that has a more summery vibe. This bag is rich in color but affordable in price. If a blazer is an absolute must in your office environment, our hearts go out to you, but that doesn't mean you can't achieve the summer vibe we know you're craving. Wear a white blazer, and pair it with all-white counterparts for a look that's guaranteed to turn heads. Because blazers don't always have to be black. What are some of your tips for dressing for the office when it's hot out? Let us know your secrets in the comments below!